The amazing thing is that I didn’t hear or feel anything when my camper came off my truck. Going relatively slow on the broken road, she must have elegantly slid backwards and plopped on the ground more or less undamaged. 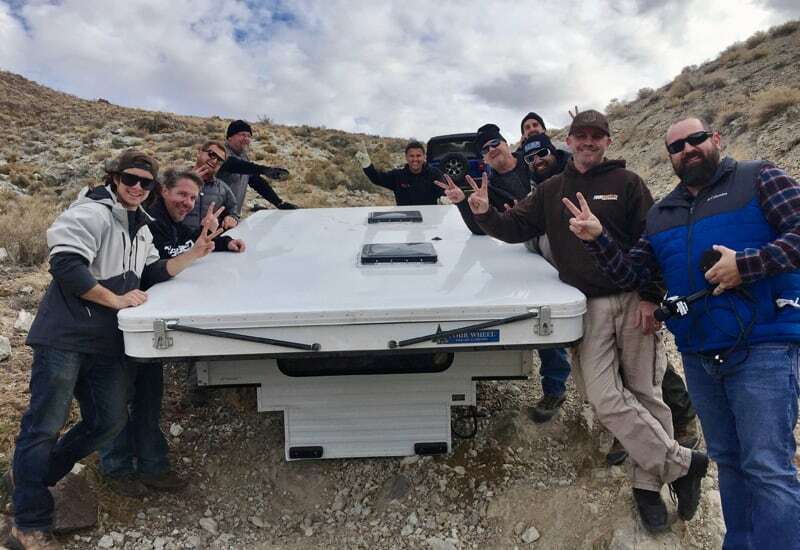 It just shows the solid construction of Four Wheel Campers. There was a little cosmetic damage on the back trim and the electrical connection was pulled out. That was basically it. I had a total of four turnbuckles. 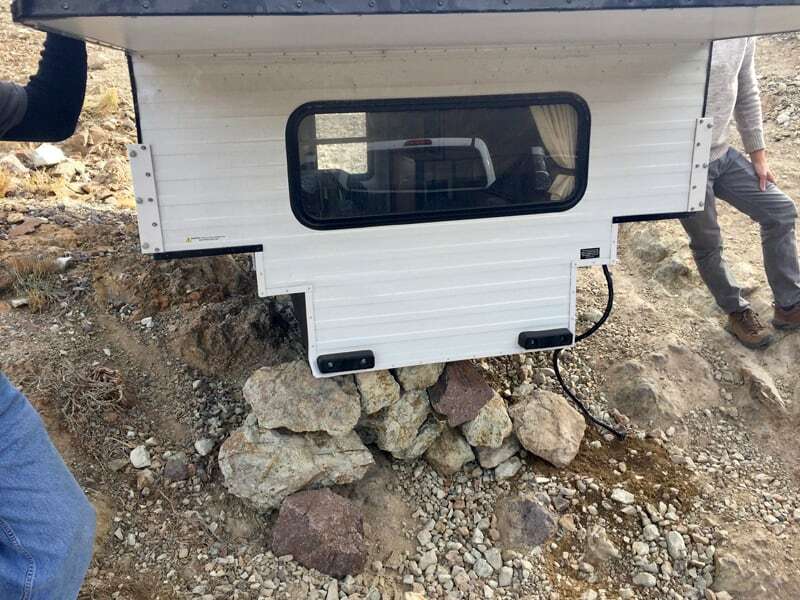 At that point three were still in the truck and one was attached to the camper. One hook had opened. I imagine it shook loose and began to shake around. The stress on that one bent it out and it moved significantly. Then the rest popped out. Once those had gone, off it flew. 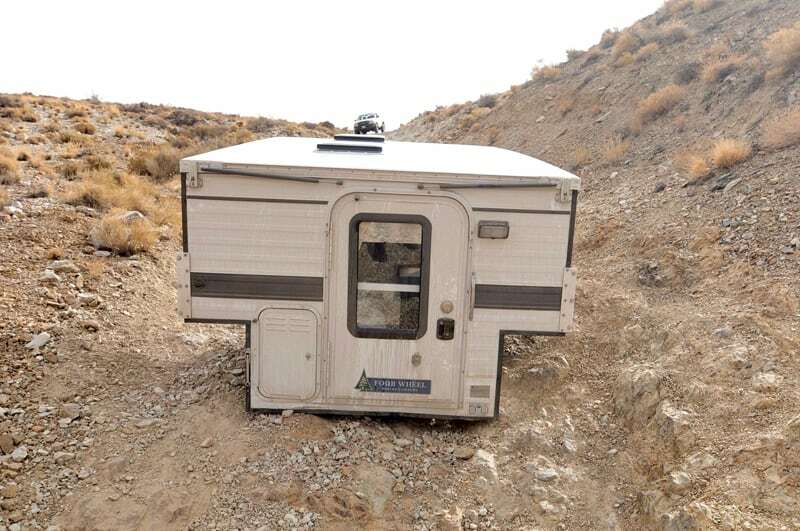 The tie-down points on the camper were fine. The road was narrow so I was thinking that I would need to get a truck with a crane. It would have to be pretty special arrangement. Maybe I could rent a helicopter to lift it out. That would be thousands of dollars. I was despondent. 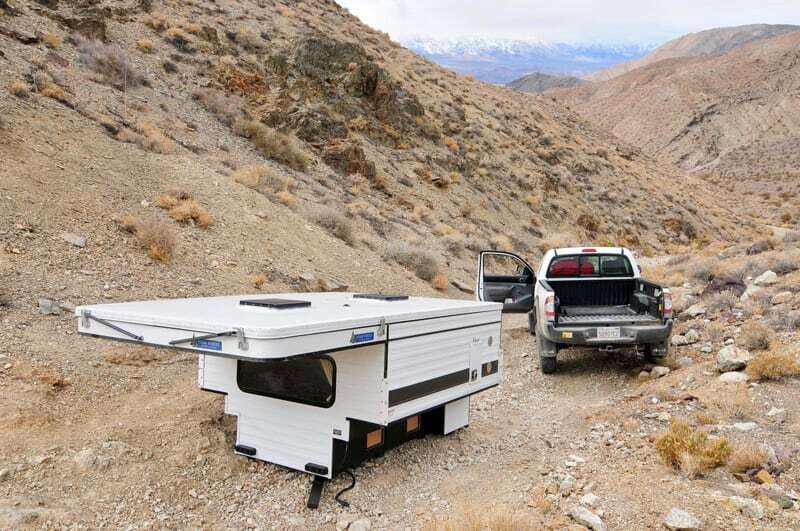 Worse, the camper was blocking the trail. I had to work my truck around it to head back to civilization. It took me awhile to get my truck around the camper. Then, I started working down the mountain. I stopped at the half way point where I stopped before. It was beautiful with pylons from mining days. The views are astonishing because you can see for miles. It was a beautiful day. I got out of my truck and walked around the corner. 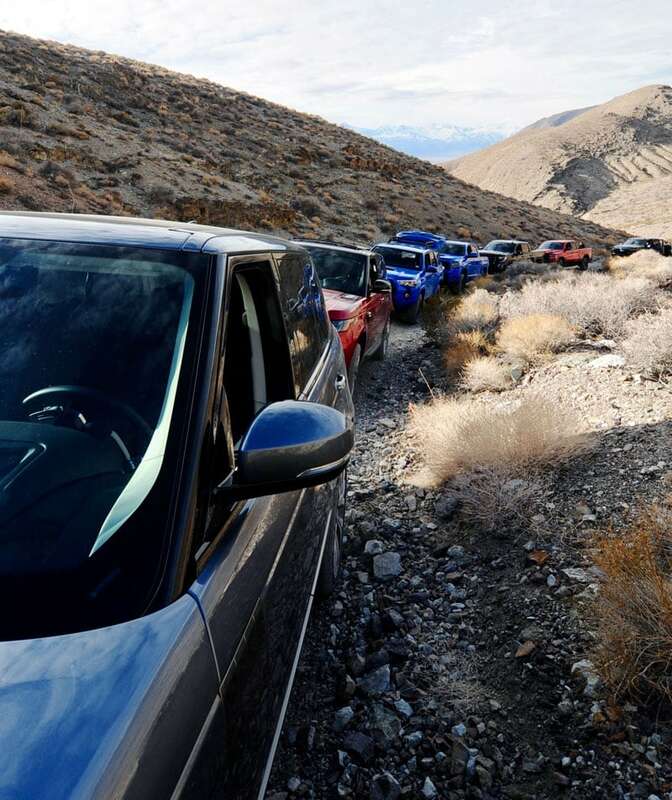 There, all lined up on the trail were several brand new, top-of-the-line, 2019 off-road vehicles. I walked down and saw guys with video cameras. I think they were more surprised to see me as I was to see them. I got in my truck and drove up to where my camper was located. It was quite a steep hill. 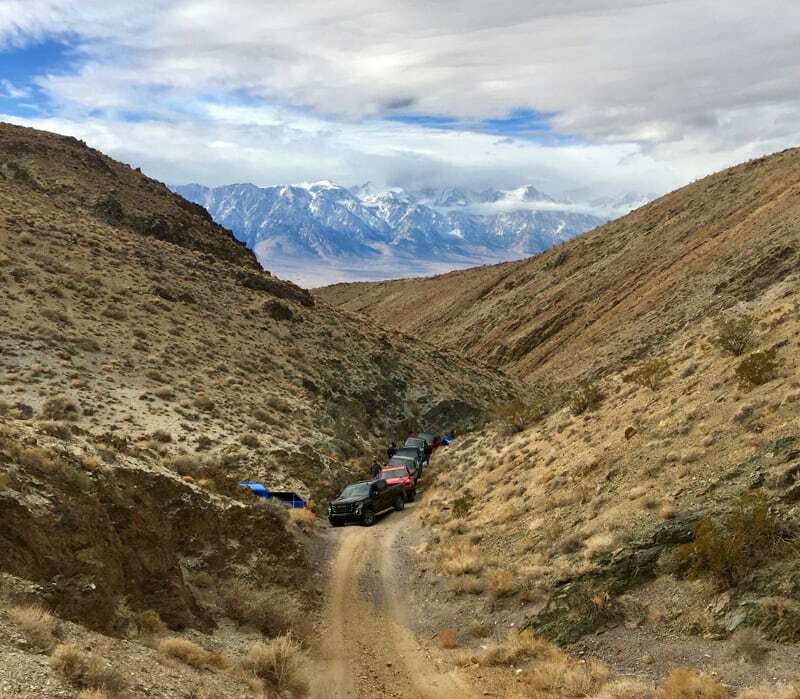 I backed my truck up to the camper so that it was going down the hill and not up the hill. That way the truck would be lower than the camper. Up they came in ten beautiful 2019 trucks. One guy, Vern, the Technical Editor, looked at me and said, “Neil, it would be good if you let me drive your truck”. He assessed me in no time at all. Vern backed the truck up to the camper. Eleven guys lifted her up and turned her 180-degrees. Then we were faced with how we would lift my 1,000 pound camper, which is quite a chunk of cheese. The guys were confident and funny dealing with this dilemma. It was the best time. They created an atmosphere of, “Don’t worry, we’ve got this under control and we’re going to look after you”. 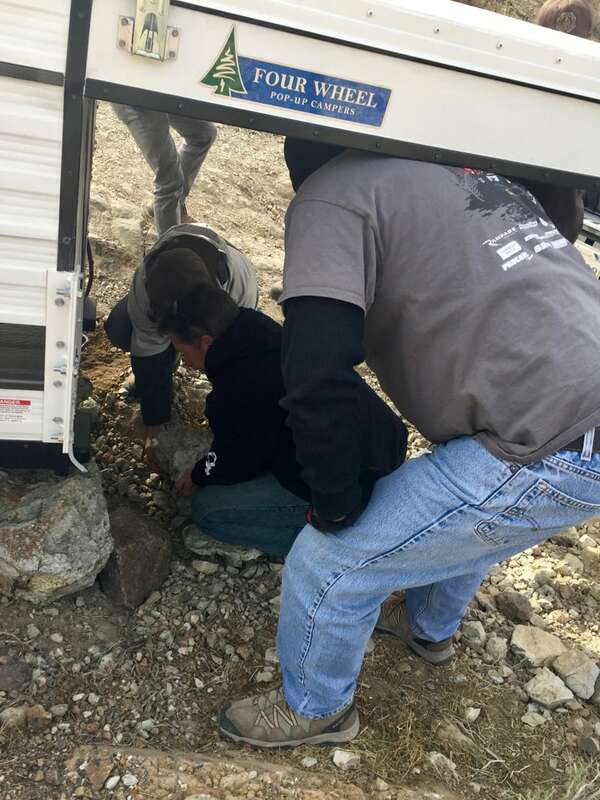 First they lifted the camper as high as they could and put some boulders underneath it. Then they lowered the truck as much as possible, deflating the tires almost completely. The air bags were also deflated. We came to find that one of the air bags had blown. That got the truck lower.